These lettuce wraps pack some Asian goodness! Chicken gets combined with peppers, scallions, carrots and a fusion of soy sauce, honey, lime, and fresh ginger to make a yummy filling for lettuce leaves. This is actually my first time using fresh ginger and I really think it made a big difference. A nub the size of my fist cost me only 68¢ at Shoprite. I simply peeled the ginger root and grated about an inch of it right in to the other ingredients. Rachel Ray recommends putting the rest of the root in a zip-lock bag and popping it in your freezer for the next time you want to cook with it. It was a simple addition that really made the meal come together. Move over PF Changs!! Precook the chicken breasts, shred using 2 forks, and reserve. In a large skillet use 1 T. of olive oil to saute the carrot, peppers, and scallions. In the meantime, in a mixing bowl, whisk together the soy sauce, juice of the limes, 3 T. olive oil, honey, grated ginger, and garlic. Once the vegetables are sauteed and tender add the reserved chicken and soy sauce mixture. Stir until everything is incorporated. Cover skillet and let cook for another few minutes. 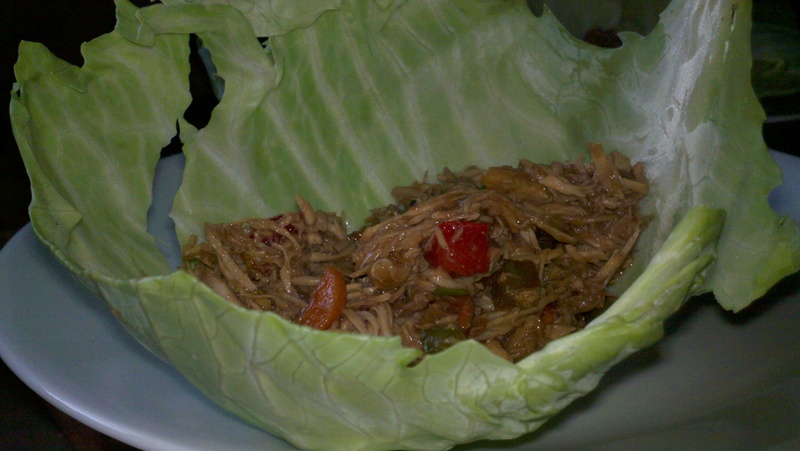 Spoon onto large lettuce or cabbage leaves.